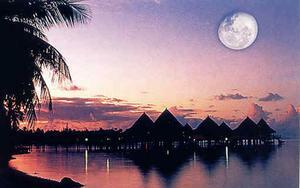 The Island of Moorea is clearly visible in all it's glory across the "Sea of the Moon" from Tahiti. To reach this breathtaking Island it's only a short 5 minute flight or a 40 minute ferry ride. Moorea has a flavor and flair all of its own with deep valleys, jagged mountain peaks and cascading waterfalls leading down to pristine beaches. This makes for a ideal location for a Pre or Post cruise stay. 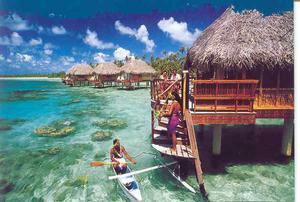 The Traditional Tahitian bungalow has always been the most desirable of Polynesian accommodation. Whether it's a garden, beach, shallow or the deep over water bungalow, this type of dwelling is reflective of the Tahitian Heritage. There is a special feeling when staying in such exotic quarters that stimulates the senses. For an occasion such as a honeymoon or anniversary or just to pamper yourself a stay in an over water bungalow would be a dream come true. The beautiful setting of Bora Bora has attracted some of the worlds most luxury hotels. Some private nearby Island Motu's that face Bora Bora, now have resort bungalows built on them. The overwater bungalows here as you would expect are highly sought after, as the whole unique "South Seas" experience is heightened in this dramatic location.